Product Information Webinars – information on new and recently launched products by Listen, Inc. 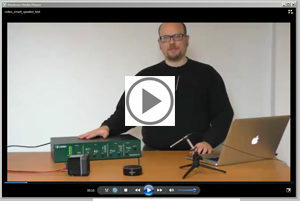 This series of 4 short training videos guides the new user through the steps needed to set up SoundCheck and Listen hardware in 4 simple steps. In this short 10 minute video, sales engineer Les Quindipan gives a brief overview of the new features and functionality, and demonstrates them in the software. In this short (10 minute) video, Brian Fallon introduces the new features in SoundCheck 14. These include an improved set-up wizard for easier transition from older versions, advanced Listen hardware integration, a redesigned hardware editor and a new autoranging feature.